It makes no difference whether a Master comes from a Jewish background, as did Jesus, or from a Muslim background, as did Kabir, or from a Sikh background, as did Guru Nanak. True Saints transcend ethnic, religious and national customs and traditions, for they know the spiritual essence that is Truth. They speak a universal language and their teachings are age-old. 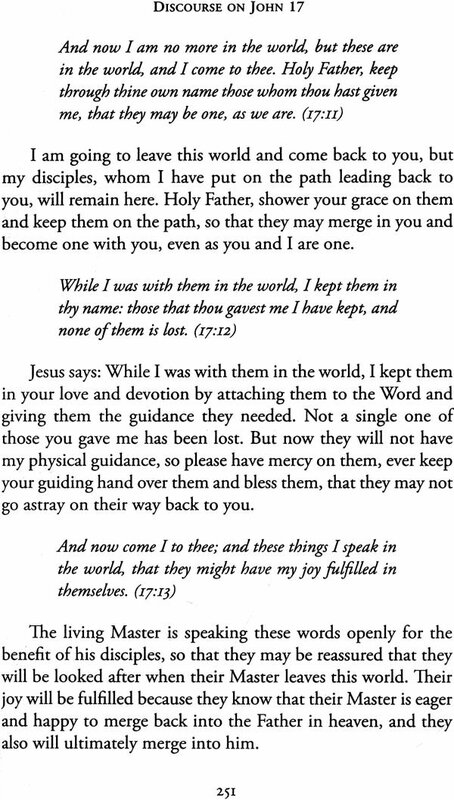 This book is a commentary on these teachings as given in the Gospel according to St. John. 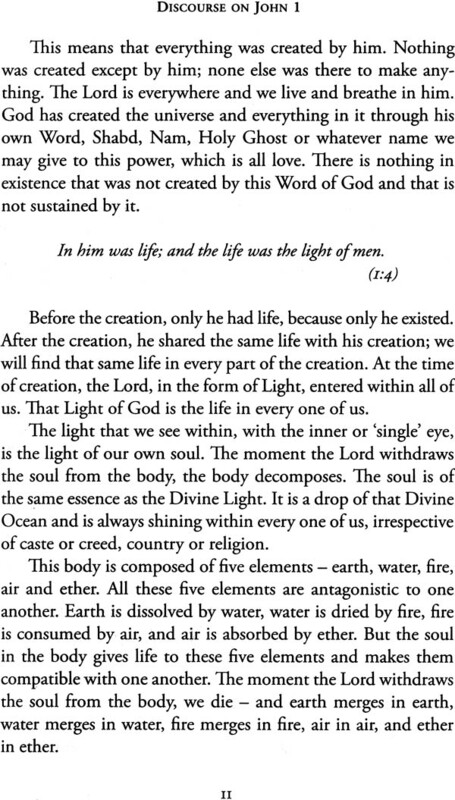 It was originally published in 1967 under the tide Saint John the Great Mystic, and consisted of a verbatim transcript of talks given in English by Hazur Maharaj Charan Singh Ji* to international visitors at the Radha Soami Colony, the Dera, in Beas, Punjab, India. The 1985 edition, presented under the new title Light on Saint John, was expanded to include excerpts from tape recordings of Hazur's talks on his travels overseas and with guests at the Dera. 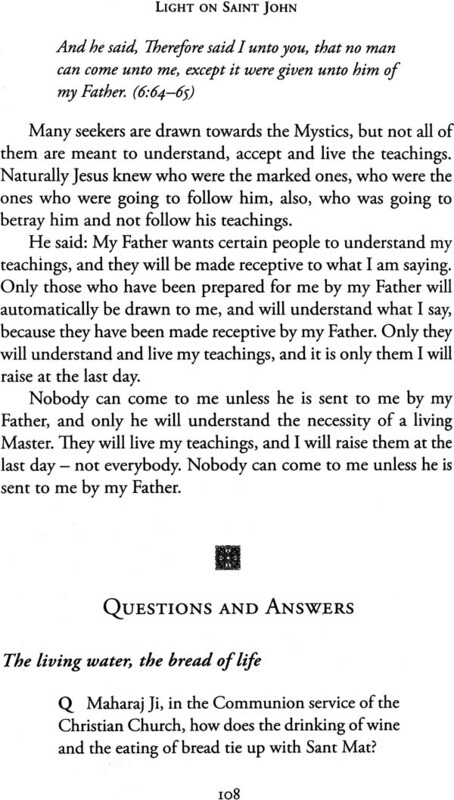 It also included questions and Hazur's answers on this Gospel, which are given at the end of each chapter. The preparation of the expanded manuscript was overseen by Hazur himself, who contributed additional material to make the book a comprehensive discussion of the Gospel according to Saint John. This 2007 edition includes a glossary, an index of Biblical verses and a subject index for convenient reference. The Gospel of St. John, like all mystic teachings, reminds us that there is one God, the God who has created and sustains the world through the creative power called in different traditions the Word, the sound current, the Shabd or Kalma. These teachings tell us that all souls come from this power into the creation, and that souls in the human form have a unique opportunity to seek a true Master, an authentic Murshid or Satguru - one who connects them with that power and lights the inner way to reunion with the Lord. Although human beings are made in the image of God, not one of us finds meaningful peace and happiness as long as the soul remains a stranger in a strange land, feeling separated from its origins. How then can we return to our true home? As Jesus and all true Saints tell us, the way back is to enter the kingdom of God within. Mystics emphasize that such a pathway does exist, that it is within each and every one of us regardless of race, nationality, gender or religion, and that it leads ultimately to God-realization: annihilation of the small self into oneness with the Lord. The universal message of Jesus is relevant not only for the Jews to whom he preached, but for seekers of any background. Light on St John may well be a revelation for the sincere Christian and for all those who are interested in truth, self-discovery and God-realization. The gift of this book is that it guides the seeker towards a deeper understanding of Jesus's teachings. 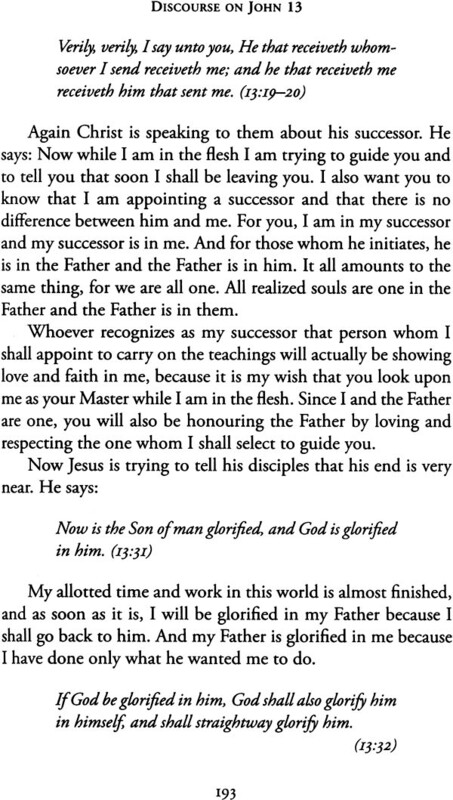 With respect and a profound spiritual understanding that goes to the heart of Jesus's sayings, Maharaj Charan Singh unveils the esoteric meaning behind the words of Jesus as well as the universality and timelessness of his message. 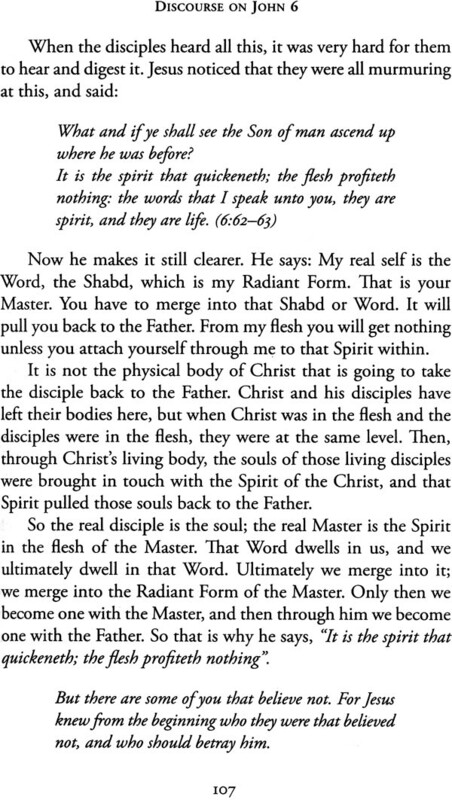 The real Christian, according to Maharaj Charan Singh, is the person who follows the real teachings of Christ. Modern-day seekers face a challenge in this: the words and teachings of Jesus were not transcribed during his lifetime, so how to know his authentic teachings? When the teachings were finally put to parchment decades later, memories were selective and filled with anecdotal stories. 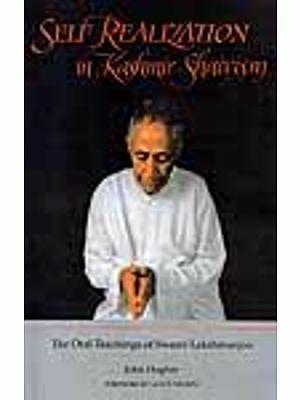 Compounding the problem, as Maharaj Charan Singh notes, is the fact that through translation from one language to another many spiritual truths are naturally lost because the translators may not have the actual spiritual experience of what they are translating. The key word here is experience. Jesus spoke from first-hand knowledge, but those who later transcribed, translated and edited the collection of his teachings may not have shared that inner experience or fully understood what his words meant. We go to living Masters because they can explain the teachings of all Masters and the inner path to the Lord in a way that people of their time can understand and put into practice. The living Master offers the seeker a relationship of loving guidance. As Christ said, "As long as I am in the world, I am the light of the world" (john 9:5). A living teacher lights our way and give us access to Reality. Maharaj Charan Singh taught the path of the Word, known also as Sant Mat, the way of the Saints. As the audiences who gathered to hear the Master speak were familiar with Sant Mat, the Master does not go into detailed explanations on these teachings, but simply brings out the essential similarity in the teachings of all true Saints. If the reader is interested in knowing more about Sant Mat, a detailed explanation may be found in other books published by the Radha Soami Satsang Beas, a list of which is included at the end of this volume. Since most of you have a Christian background, I shall try to explain the teachings of all the Saints in the light of the Bible, for their teachings exactly coincide with those contained in the Bible, if rightly understood. Rulers, priests and politicians always try to suppress the truth. So it was in the time of Christ, and even more so in that of the Old Testament. The truth had to be spoken in veiled language so that it could be understood only by the real seekers. 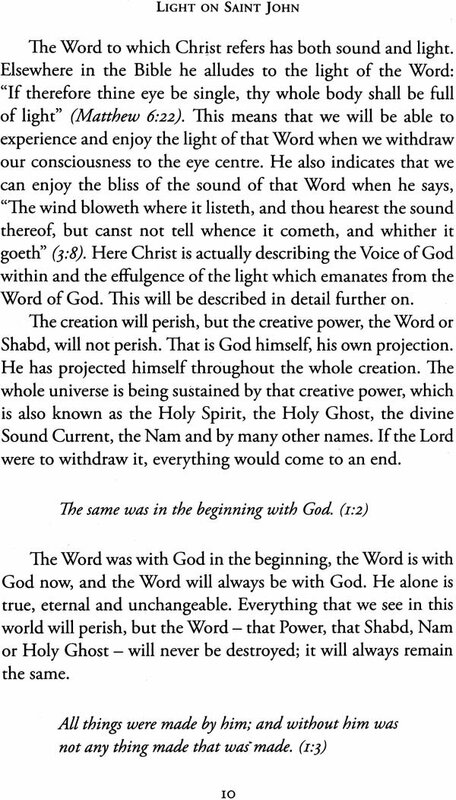 Every word spoken by Christ has a deep, mystic meaning. While I am no authority on the Bible, when I first read it I was amazed to find that even the little that has been handed down to us as the teachings of Jesus substantially tallies with the teachings of all true Saints, regardless of their colour, religion, country or time. The truth is always the same, but after the departure of the spiritual teacher his message is forgotten and is given the shape of an organized religion with rites, ceremonies and dogmas. Eventually all emphasis is placed on these rites and ceremonies, and the real truth is lost. As you all know, Christ had very little time to share his teachings with the masses; he lived for only a very short period. And then he could not stay in one place - he moved from one place to another. He was hunted by the priests of the organized religions, who are always frightened of the popularity of the Mystics, because that generally affects their income. Unfortunately for posterity, the Bible was not written by Christ himself, nor were notes taken at the time that he spoke so that we could have his teachings verbatim. They were passed on by word of mouth, and that portion which was remembered was recorded many years after his crucifixion. Yesterday Professor Bhatnagar read to you from Kabir. * If, with your best effort, you tried to reproduce today what you heard from him only twenty-four hours ago - and in this modern age you are all intellectual people - the result would hardly be fifteen percent of what he said, and that would not be in the exact words of Professor Bhatnagar, it would only be the gist of what he told you. Then, if you go and tell your friend, who has never heard Professor Bhatnagar, that this is what he said yesterday, and your friend tries to reproduce that on paper after just twenty-four hours, how much of what Professor said will be left? And if what is left is translated from one language to another language and then to a third language, perhaps only five percent of what Professor Bhatnagar said will be left. This is what happens after only twenty-four hours, and the Bible was written many years after the crucifixion. And then, Christ was addressing very simple people - some were fishermen, some farmers, some were carpenters, and so on. They were not intellectuals, men of letters. Accordingly, the precise words and statements of Christ are not with us today, though the writers of the Gospels did capture much of his meaning. 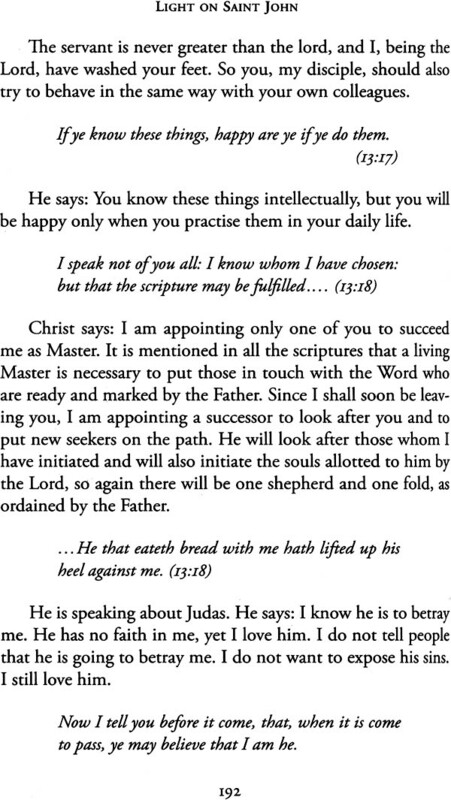 The Gospels themselves are according to Saint John, according to Saint Matthew. They were not even written by people who knew Christ personally. Moreover, the Bible has gone through many translations and through the hands of many people who wanted to suppress whatever did not suit their own selfish ends. It is a wonder that we still have so much of the mystical truth left. By translation from one language to another, many spiritual and mystical truths have been lost from the Bible, because the scholars themselves had no experience of what they were trying to translate. They intellectually tried to translate the teachings of Christ, but as they had no experience of their own, they did not understand many things, and in 'straightening' the language in the modern versions of the Bible, much of the depth and meaning has been lost. I would say that many things which they could not understand have been eliminated. 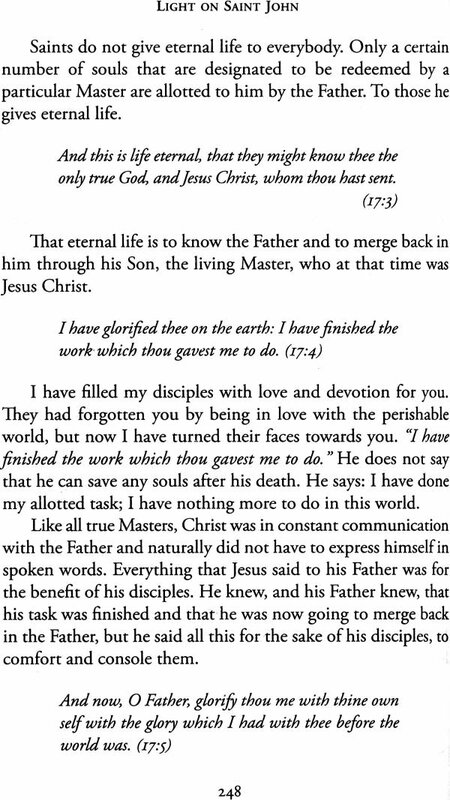 For example, I was reading The Gospel according to Thomas, a manuscript found in Egypt. The translator has given the original Coptic language on one page and his own translation on the opposite page, so that scholars can see whether or not he has done justice to the original. At one place is mentioned five trees which are eternal: "For you have five trees in Paradise, which are unmoved in summer (or) in winter, and their leaves do not fall. Whoever knows them will not taste death. "* It must be referring to the five sounds and five regions frequently mentioned by Mystics; at least I could not find any other meaning. It is clearly written, but is found nowhere in the Bible, which suggests that much is missing from the Bible. I have also compared parts of the King James version of the Bible with modern English versions, and there is a lot of difference. 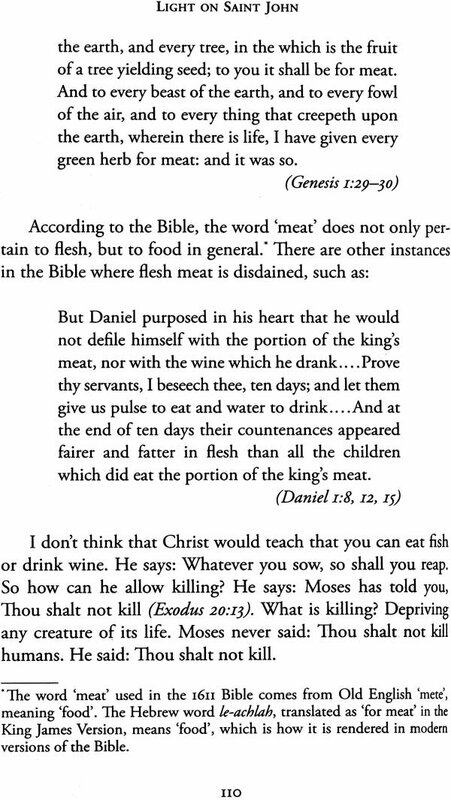 At many places the word meat occurs in the King James version, but in the English of those days meat did not mean flesh, it was the word for food. * In modern translations it says food in those places. First it was clearly written, "Thou shalt not kill" (Exodus 20:13). Now they have replaced it with "You must not murder". Murder refers to human beings only. The scholars translate and 'straighten' the English, but they often misinterpret his teachings and misguide the people. Fortunately, Jesus spoke in such simple language that his parables, which contained deep, hidden meanings, seemed meaningless to his contemporaries. As a result, they were not tampered with, and we still have these beautiful jewels in the Bible from which we can glean the mystical gist of his teachings and corroborate them with the teachings of Saints of ancient and modern times. But one cannot read the Bible like a novel, nor can one read it like a legal document, interpreting every sentence, every period and comma, because many links are missing. It has to be studied with concentrated attention if we want to understand its true meaning. Saints may come into this world at any time and in any country, yet their teachings are bound to be the same. The teachings of different Saints cannot themselves be different. Because the Lord is one, the way to realize him must also be one, for he is within every one of us. 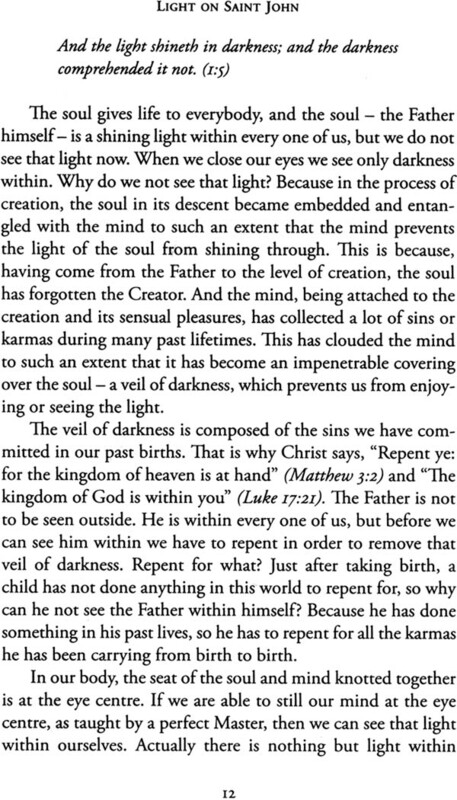 We have to search for him within ourselves, under the guidance of one who has himself realized him within, as Christ did in his lifetime. Naturally there cannot be two or more inner paths leading to God; there can be only one. The rites and rituals of all religions are our own creation, but at the base of all of them is the same essence of Truth , Reality and Spirituality . Masters may take birth in any nation, race or religion, but they all preach the same Truth. They come not to condemn any religion nor to establish a new one, but to create in us a longing for that Reality, and they explain to us the method and means to realize it. They all have the same message to give, the same spiritual Truth to share with us. Christ, too, in this Gospel, has referred to that Truth and has drawn our attention to the Father, the creative and sustaining Power within. Different Mystics, at different times, have referred to that same Power by different names. Christ called it Word, Logos, Spirit, Name, Holy Ghost and the Voice of God. Persian and Arabic Mystics have named it Kalma, Bang-i Asmani, Nida-i Sultani, Ism-i Azam, Sultan al-Azkar and many other names. Indian Mystics have called it Akash Bani, Ram Nam, Ram Dhun, Nirmal Nad, and, more generally, Shabd or Nam. The Chinese called it Tao. This divine Power is also known by many other names. All true Mystics point only towards that Realiry, by means of which the Lord created this universe. That same Reality is the Lord himself, who is the very foundation of all that is manifested and who keeps the creation in existence. When we realize that Reality within ourselves, we become whole and pure, and worthy of becoming one with the Lord. After such Saints and Mystics leave the world, we deviate far from their real teachings and become entangled in rites, rituals and ceremonies, which lead us ourwards. Thus we arrest the real teachings in small, narrow compartments and give them the forms of religions, nations and countries. Then we begin to quarrel with one another. 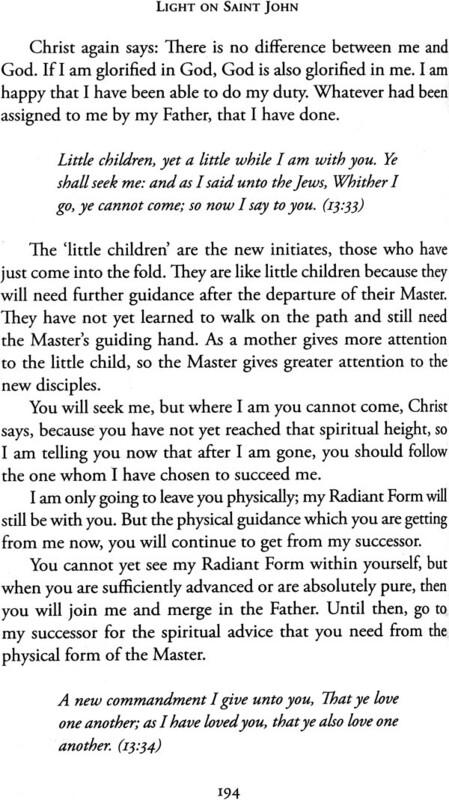 The path has always been the same. It has been taught by all Saints and it is also taught now, in modern times, to all true seekers and lovers of the Lord. That is why there is so much similarity between the teachings of the Bible and those of Persian, Indian and other true Mystics. The teachings are the same: the approach may be different, our interpretations may be different, but the teachings cannot be different. Christ's parables had to suit the conditions that existed in that area at that time, but today we cannot as effectively employ the same parables, because conditions now are different. People are perhaps more intellectual, and parables that suited the conditions two thousand years ago may not be able to satisfy the modern mind. For example, somewhere in the Bible is written that 'eagles' or vultures come wherever there is a carcass. 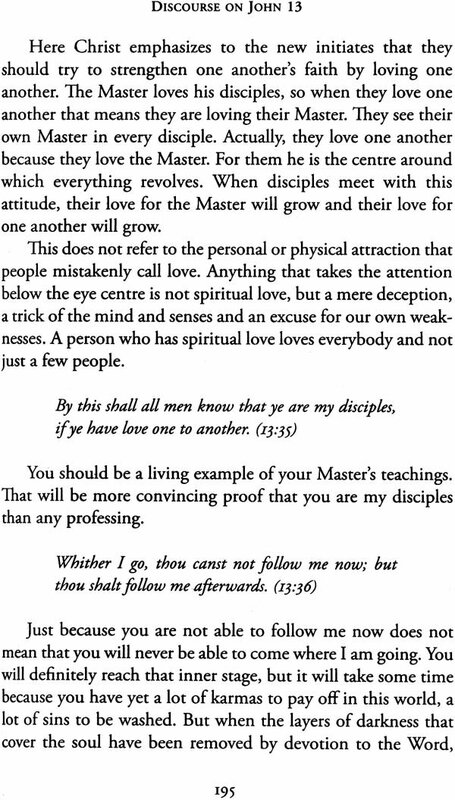 * Christ was explaining that whenever a Son of the Father comes, devotees always flock around that Mystic to imbibe his teachings. The example appears to be crude and not in good taste, but I think Christ had no other option, because that was the only way he could illustrate his teachings to those desert people. In a desert, when there are dead bodies, vultures gather to eat the carcasses. Those people understood what he was trying to explain much better with this example than they would have with any other. Saints have to explain their teachings, keeping in view the background, the intellect and the traditions in which the people in the audience have been brought up. 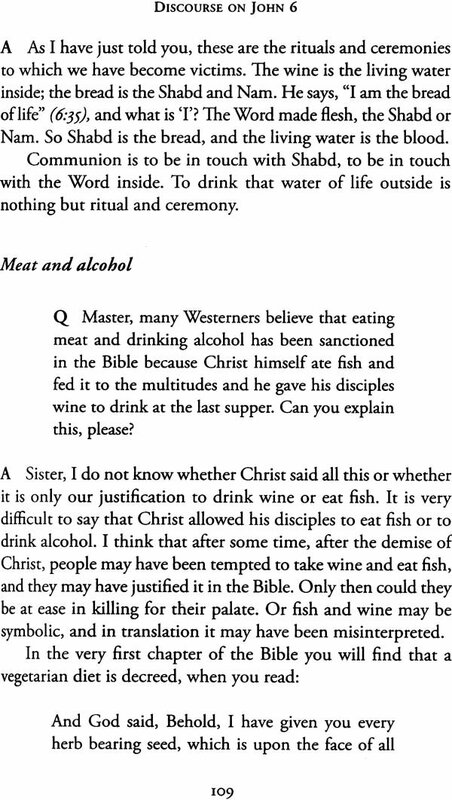 But still, many of the mystic parables and similes that I read in the Bible are like those given by other Mystics, and even their way of explaining is the same. Christ refers to the key to the door of heaven and Guru Arjun Dev, the fifth Guru in the line of Guru Nanak, also refers to the same thing. 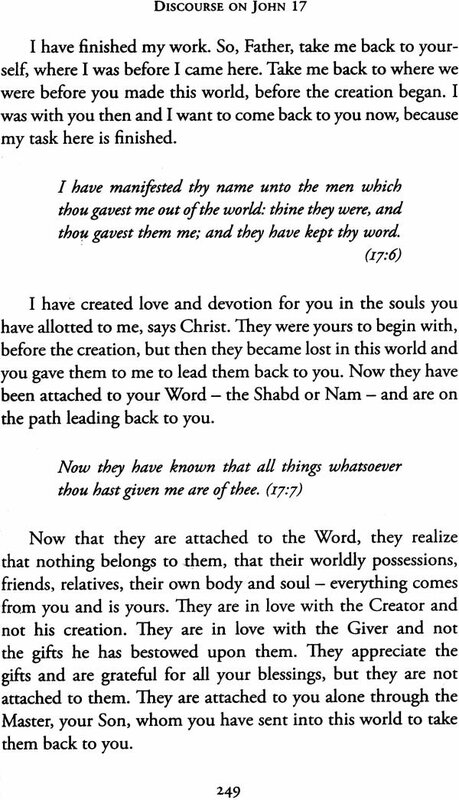 I was reading a book written by a missionary who even wrote to the extent that Guru Nanak seems to have borrowed all these ideas from Christ, because the ideas are similar. But historians do not understand that whosoever walks on the same path and reaches the same goal will have the same things to explain. There is no question of one borrowing from the other, because in the time of Guru Nanak, Christianity was hardly known in India. Hence the question of Guru Nanak having any contact with the missionaries or reading the Bible in any way does not arise. If you go deep into the roots of Christ's teachings, you will find that his teachings are the same as the teachings of all other Saints, and in that light I will discuss Saint John with you.